Phase 1: There goes a period with deep thinking and research, doing fast writings with unreadable rough draft for others than the composer. This has to be fast, because the ideas have to disappear and be changed with other ideas. Under the research, some of the ideas comes with music and text at the same time. Phase 2: All ideas and notes will be collected and rewrote by hand without any kind of a music instrument, because an instrument will disturb the composers concentration too much in this process. Phase 3: Now, the music instrument (piano) comes in for correction, if there are some writing mistakes in phase 2. 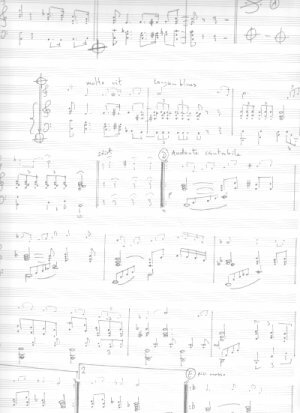 Phase 4: When everything are edited, comes the tiresome work: to write out the instrument and soloists parts. This phase are very time-consuming and boring, because everything has to be wrote clear and nice, so the musicians are able to read it and play it. Phase 5: are very inspiring and filled with fun: the rehearses and the first concert.